Six months later, on January 4, 2018, the IIF has released its latest global debt analysis, which reported that global debt rose to a record $233 trillion at the end of Q3 of 2017 between $63Tn in government, $58Tn in financial, $68TN in non-financial and $44Tn in household sectors, an total increase of $16 trillion increase in just 9 months. According to the IIF, private non-financial sector debt hit all-time highs in Canada, France, Hong Kong, South Korea, Switzerland and Turkey. 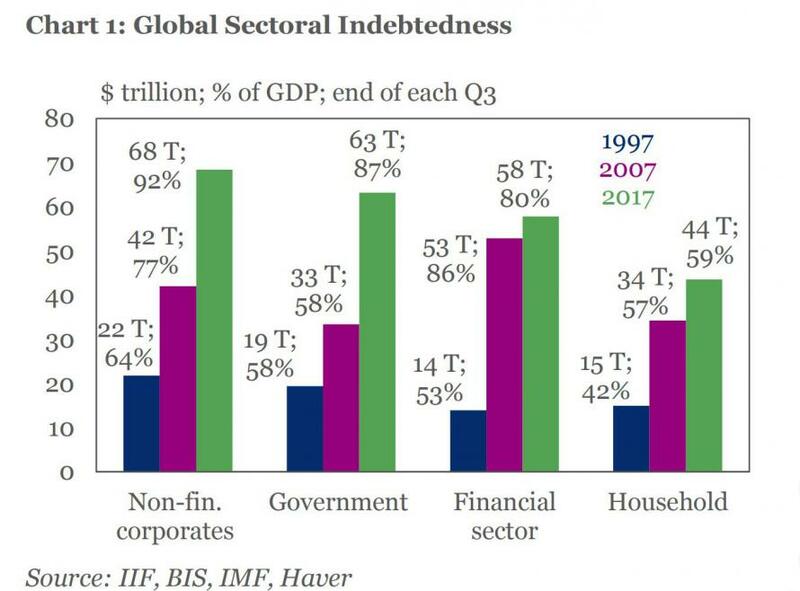 And yet, largely as a result of the ongoing Chinese crackdown on shadow banking, even as global debt rose to new record highs, the ratio of debt-to-GDP fell for the fourth consecutive quarter as economic growth accelerated. The ratio is now around 318%, nearly 10% below the high set in the first quarter of 2017. In the annual report, the IIF notes that "a combination of factors including synchronized above-potential global growth, rising inflation (China, Turkey), and efforts to prevent a destabilizing build-up of debt (China, Canada) have all contributed to the decline." Still, while global GDP has enjoyed a period of accelerating growth, this may soon come to an end even as debt levels continue to rise. Meanwhile, the debt pile could act as a brake on central banks trying to raise interest rates, given worries about the debt servicing capacity of highly indebted firms and government, the IIF analysts wrote. 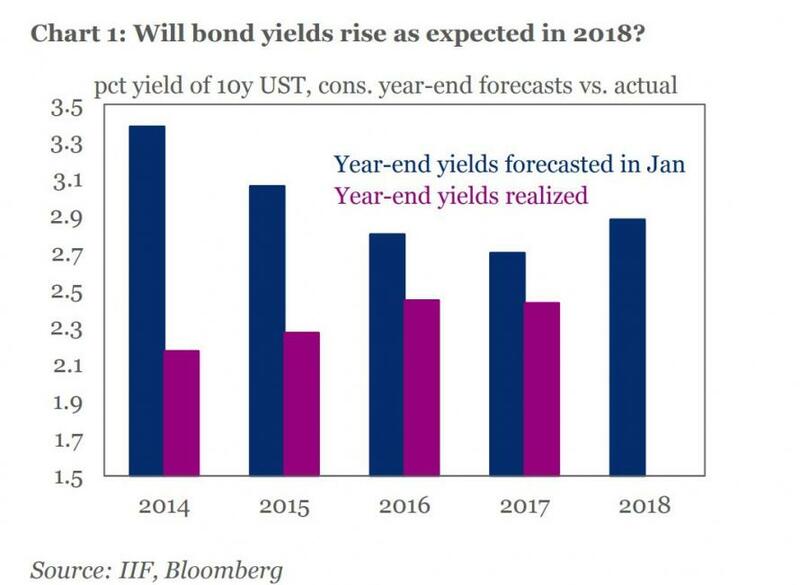 And speaking of rates in 2018, the IIF pointed out that after several years of forecasters reducing their year-end rate predictions, 2018 is the first year in many when "for a change" forecasters are predicting a rebound in interest rates. Maybe this is the one year when "experts" will finally be right when it comes to interest rates.